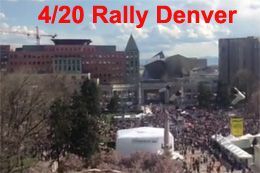 This is the first year of the 4/20 rally that marijuana is legal in Colorado, so it's not surprising there is a huge turnout at Civic Center Park in Denver. At 4:20 p.m., the tens of thousands of celebrators are expected to light up, even though it is still illegal to smoke pot in public. Organizers say between 50,000 and 80,000 are expected to attend over the two days. Police described the first suspect as a light complexioned black male, about 6-feet tall and weighing about 180 pounds. He was wearing a gray hoodie, black pants and a Carolina blue baseball cap. The second suspect was a black male in a checkered black and white shirt.